Okmulgee County is a county in the U.S. state of Oklahoma. As of the 2010 census, the population was 40,069. The county seat is Okmulgee. Formerly part of the Creek Nation, the county was created at statehood in 1907. The name Okmulgee is derived from the Hitichita (Lower Creek) word okimulgi, meaning "boiling waters". Okmulgee County is included in the Tulsa, OK Metropolitan Statistical Area. The Creek Nation moved into this part of Indian Territory after signing treaties exchanging their land in Georgia and Alabama in 1826 and 1832. The actual move occurred over the period from 1827 to 1836. The Creek Nation government, led by chief Samuel Checote, revised its constitution in 1867 and designated Okmulgee as its capital in 1868. The U.S. Post Office opened in Okmulgee on April 29, 1869. The Creek Nation built its council house in Okmulgee, a log building, in 1869. The building was rebuilt of stone in 1878. Okmulgee County was formed on July 16, 1907, from Muskogee land, with a population of 14,362. 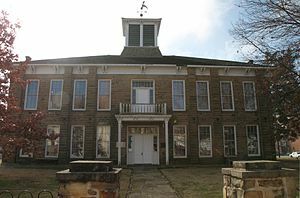 County government offices were located in the Creek Council House until 1916, when the present Okmulgee County Courthouse was built. Since then, the former council building has been used as a Muscogee Creek history museum. The county's population was 21,115 in 1910 and increased to a high of 56,558 by 1930. Railroads came to the area in 1900, when the St. Louis, Oklahoma and Southern Railway (later the St. Louis and San Francisco Railway or Frisco) built a line from Sapulpa, Oklahoma via Okmulgee to a place near the Red River. The Shawnee, Oklahoma and Missouri Coal and Railway (later also acquired by the Frisco) built a line from Muskogee to Okmulgee in 1902-03. It was abandoned in 1973. The Missouri, Oklahoma and Gulf Railway (purchased by the Kansas, Oklahoma and Gulf Railway in 1919) ran through Dewar, Oklahoma beginning in 1909, and the Okmulgee Northern Railway operated between Okmulgee and Deep Fork from 1916 to 1964. In 1918, the line between Okmulgee and McIntosh counties was realigned, moving the towns of Grayson and Hoffman from McIntosh into Okmulgee County. According to the U.S. Census Bureau, the county has a total area of 702 square miles (1,820 km2), of which 697 square miles (1,810 km2) is land and 5.0 square miles (13 km2) (0.7%) is water. Okmulgee Lake and Okmulgee State Park lies southwest of the city of Okmulgee. The eastern part of the county is within the Eastern Lowlands physiographic region and the western part is in the Osage Plains. The Deep Fork of the Canadian River is the principal waterway in the county. Deep Fork National Wildlife Refuge lies within the county. As of the census of 2000, there were 39,685 people, 15,300 households, and 10,694 families residing in the county. The population density was 22/km² (57/mi²). There were 17,316 housing units at an average density of 10/km² (25/mi²). The racial makeup of the county was 69.73% White, 10.20% Black or African American, 12.85% Native American, 0.19% Asian, 0.02% Pacific Islander, 0.61% from other races, and 6.40% from two or more races. 1.95% of the population were Hispanic or Latino of any race. There were 15,300 households out of which 32.00% had children under the age of 18 living with them, 52.80% were married couples living together, 13.10% had a female householder with no husband present, and 30.10% were non-families. 27.10% of all households were made up of individuals and 12.60% had someone living alone who was 65 years of age or older. The average household size was 2.53 and the average family size was 3.06. In the county, the population was spread out with 26.90% under the age of 18, 9.50% from 18 to 24, 25.30% from 25 to 44, 23.30% from 45 to 64, and 15.10% who were 65 years of age or older. The median age was 37 years. For every 100 females, there were 95.20 males. For every 100 females age 18 and over, there were 90.80 males. The median income for a household in the county was $27,652, and the median income for a family was $33,987. Males had a median income of $29,935 versus $20,861 for females. The per capita income for the county was $14,065. About 14.90% of families and 18.90% of the population were below the poverty line, including 24.90% of those under age 18 and 15.50% of those age 65 or over. The county is governed by a three-person Board of Commissioners. ^ a b "State & County QuickFacts". United States Census Bureau. Archived from the original on July 15, 2011. Retrieved November 12, 2013. ^ a b c d e Glynnis Coleman. "Okmulgee County" Encyclopedia of Oklahoma History and Culture. Accessed January 4, 2012. ^ Lynn Marie Townsend, "Grayson." Encyclopedia of Oklahoma History and Culture. Retrieved January 18, 2013. ^ Lynn Marie Townsend, "Hoffman." Encyclopedia of Oklahoma History and Culture. Retrieved January 18, 2013. ^ "U.S. Decennial Census". United States Census Bureau. Archived from the original on May 12, 2015. Retrieved February 21, 2015. This page was last edited on 27 February 2019, at 23:53 (UTC).